Addressing an audience of small business owners and entrepreneurs, Gov. Ted Kulongoski highlighted Oregon’s economic recovery and emphasized that there’s plenty of good news for businesses across the state. More than 100 business leaders from various industries attended the event held at The Benson Hotel. The event was organized by the Oregon Small Business for Responsible Leadership, a nonpartisan progressive advocacy group for small businesses and entrepreneurs. 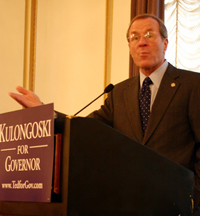 Kulongoski, who was elected Governor in 2002, faces Republican challenger Ron Saxton in this year’s November elections. Creating a business-friendly environment is a priority for Oregon, and much effort has been made to ensure that the state works efficiently and effectively in meeting the needs of small business owners. “We looked at what we can do to streamline the permitting process and reduce the paperwork. There’s a report by the Department of Consumer and Business Affairs that shows we’ve done quite well. We’ve saved the state $50 million with the reforms that we put in. We’ve taken some 250,000 pages out of the regulatory process in state government,” he said. Improving business services also necessitated the need to improve the state’s transportation infrastructure. Kulongoski is a strong supporter of infrastructure projects because not only do they improve business prospects for the state, they also have a positive effect on job creation. During the first legislative session of his administration, the state invested about $2.5 billion in Oregon’s transportation system, in addition to the $2.5 billion the state received from the Federal Highway Reauthorization Act. In 2005, Kulongoski expand Oregon’s Emerging Small Business Program (the state’s race and gender neutral certification program), increasing the number of ODOT projects designated for businesses owned by minorities, women and/or certified emerging small businesses. The expansion also nearly doubles the time a business may participate in the program, as well as increasing the size of contracts that can be awarded. For the first time, Kulongoski required the state to track the contracts awarded to women and minority-owned businesses through the program to ensure such enterprises are taking advantage of the opportunities available. While a college-educated employee pool is important in supporting the growth of Oregon businesses, nurturing a pool of highly trained workers in the trades is equally important. He cited that only 28% of Oregon residents have a baccalaureate degree or higher. In his talk, Kulongoski also addressed his administration’s efforts at keeping health care costs low through the Healthy Kids Initiative, which seeks to insure all children through age 19. Efforts also are being made to expand coverage of the Oregon Health Plan, to include more adults and children across the state. “We have more than 600,000 uninsured in the state, but that doesn’t mean they’re not getting health care. They get it—but they access the health care system at the most expensive spot: at the emergency room.” Cost-shifting has caused costs of health care skyrocket for many businesses, large and small.